The absolute best part of my day in Bean Town was who I was with. For me Boston was all about spending the day with Brendan, my middle child and self proclaimed “good son”. And food, because any day with Brendan will definitely be about food! The first is that they are always close to me whether I live next door or half way around the world. They are part of me and I carry them in my heart wherever I go, so feeling close to them has little to do with our physical proximity. That my friends, is up to me. And now I have Boston with Brendan. We just had the one day there on our way from Cape Cod to our new place in Ipswich, and my focus was on relishing my time with him and enjoying every gosh darn moment rather than trying “to see it all”. But we managed to pack in quite a bit and to me the day was no less than perfect. We drove up from the Cape early on a Saturday morning making only a mandatory stop at a Dunkin Donuts, which easy to do as they are literally on EVERY corner in New England with hardly a Starbucks to be found. We arrived at Faneuil Hall just in time for lunch and enjoyed an amazing family style meal At Durgin Park. It really doesn’t get much more old world and traditional New England than this with chowder, baked beans and corn bread a mile high. Thank you Richard for the great recommendation! 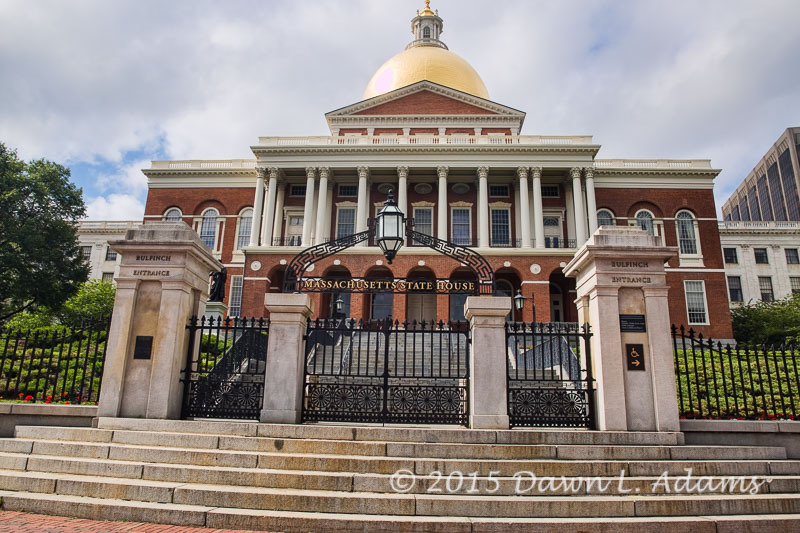 The Freedom Trail was next on our agenda as we were in agreement that no trip to Boston would be complete without it. It would be easy to spend an entire day on this alone, immersing yourself in all the history that was made here. There are guided tours available but we decided to just follow a map and stroll a long at out own pace, which is always much more my style. 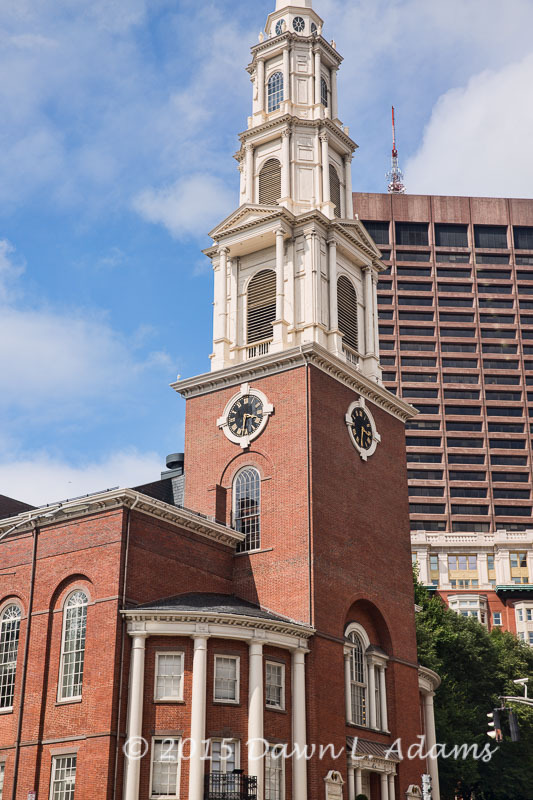 The trail walks you through history and includes sites such as the Old State House, the site of the Boston Massacre, Paul Revere’s House, and the USS Constitution. So much to see and so little time but we did our best! 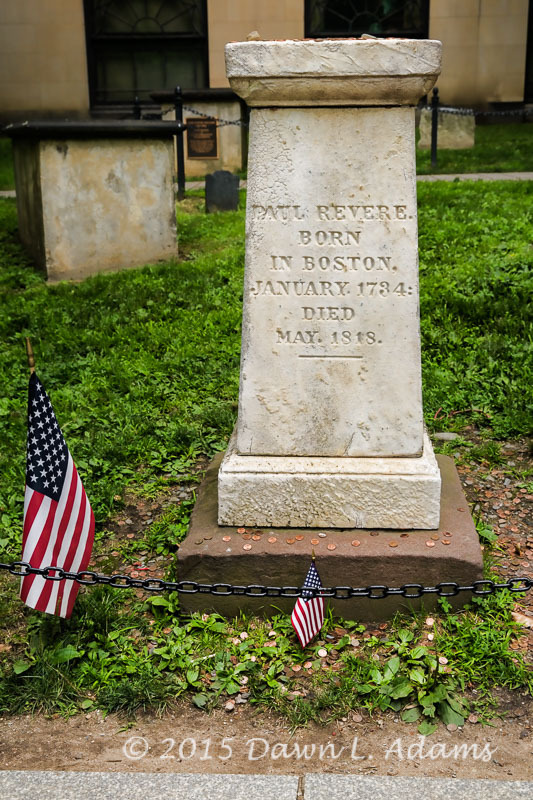 I did take few minutes though to wander through the Granary Burying Ground to pay my respects and say a little thank you to our some of the forefathers that are buried here. 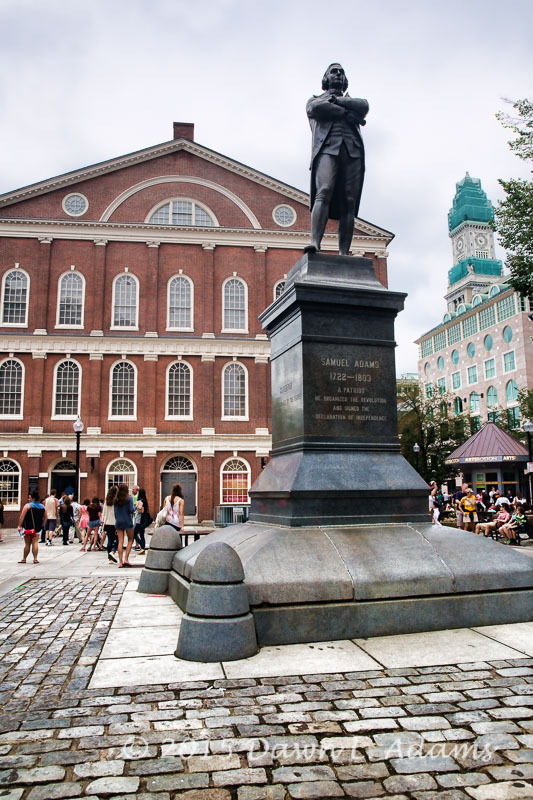 Paul Revere, Samuel Adams, John Hancock, and Robert Treat Paine all make the Granary their final resting place. Be careful where you walk. Literally! It occurred to me that I’ve walked through quite a few cemeteries lately mostly because they are just there and available. But it makes me think about how much our approach to the dead has changed in recent years. As I child growing up in Southern California I don’t remember ever seeing cemeteries in my daily life. They were always on a hillside somewhere on the outskirts of town and not something I experienced very often. It seems to me in thinking about it now, that in days gone by cemeteries were a part of daily life not separated from it, and much more likely to be located in town and amongst the living. I wonder when this out of sight out of mind approach became the norm? Saving the best for last we finished up our day in the North End which is often referred to as Little Italy. 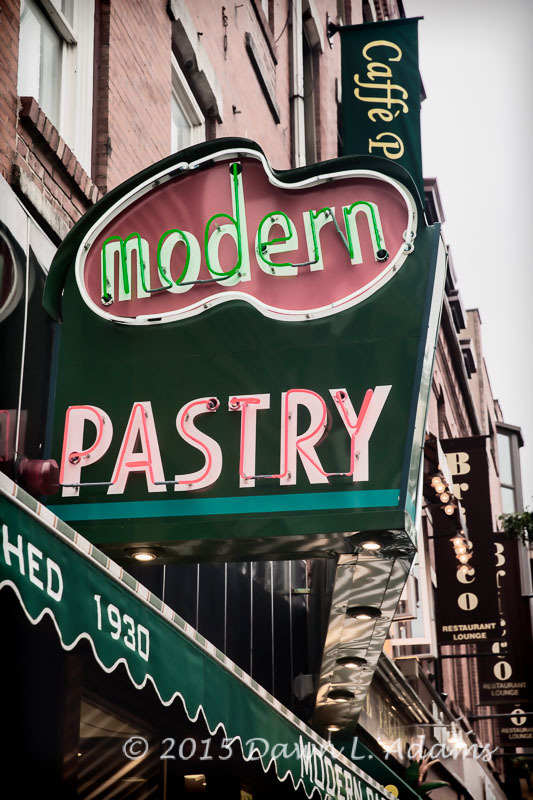 It felt like a step back in time with the old cobblestone streets and retro signage still in place. I could easily imagine what life must have been like here during the 40’s and 50’s and images of the classic cars and people from that time danced in my head as we made our way through the busy streets. True to form, food was weighing heavy on both out minds. We’d done our homework and knew where we were going so exploring done, we took our tired feet and empty stomachs and headed straight for Mama Marias. Their gluten free menu sealed the deal for me but I would have gone there just to sit and have a glass of water. Winding up the crooked old stairs to the top floor I knew I was in for a treat. With wall to ceiling windows the view over North Square and Paul Revere’s House the view was amazing. The food was even better - classic and traditional Northern Italian yet slightly updated it was the best gluten free pasta I’ve ever eaten. And best of all, I was sharing it with my middle child Brendan, otherwise known as the good son. PS - All three of them really are my good sons and here they are. Just don't tell Brendan. Older PostP-Town and Truro and Bears, oh my!